In the USA, mass opportunistic screening has resulted in the increased detection of prostate cancer and an increased proportion of patients who are candidates for curative therapy. Screening has also resulted in the increased detection of low-risk cancers that may pose a relatively low threat to survival and quality of life, particularly for patients with limited life expectancy. No treatment has been definitively proven to be superior to another in terms of quantity and quality of life. 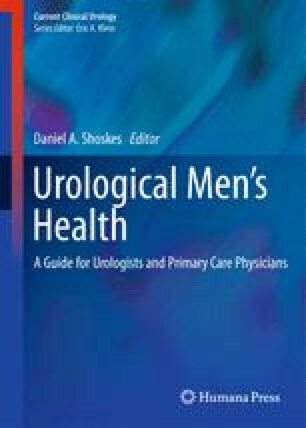 However, all definitive treatments (radical prostatectomy, EBRT, and brachytherapy) may negatively impact urinary, bowel, and sexual function. As there are substantial trade-offs between in terms of benefits and risks of treatments that are likely sensitive to patient preferences, it is recommended that patients be informed of all potential treatments options with adherence to published guidelines. In general, there is an underutilization of active surveillance, particularly for low-risk patients and those with limited life expectancy. Radical prostatectomy and external-beam radiotherapy with 2–3 years of adjuvant androgen deprivation therapy are the standard options for high-risk disease. The outcomes of patients undergoing definitive local therapy are favorable, particularly in terms of the low risk of clinical disease progression and serious morbidity. Outcomes appear to be sensitive to the expertise and skill of the treating urologist and oncologist.